Friday, April 26th is the district wide Care to the Core Event. Please have your child wear their Snow School shirt to school tomorrow or our Snow colors of blue and white. 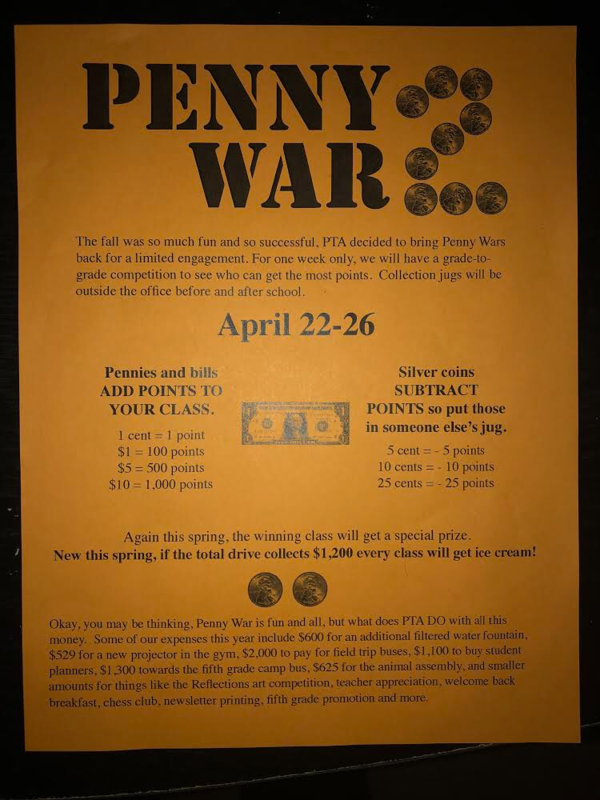 Penny War day 3 – we are half way through this battle. How is your class doing? For now, the battle appears to be between fourth and second grades. Penny War continues through Friday. Pennies AND bills are positive points for your class. Silver coins (quarters, nickels and dimes) subtract from that class. Collection jugs are outside the office before and after school. Thank you to the Murray Family for donating Clorox wipes to our classroom. We can definitely use more if other families are willing to donate! We appreciate all of the Little Caesars Pizza Kits you’ve sold!!! 24th ! Pickup is from 3:30 p.m. to 5:00pm. The ABC Countdown will start on Friday, May 3rd. Please go to the Sign Up Genius link if you are able to donate items for certain days. Earth Day t-shirts are on sale until May 8th. The cost is $6.00 per shirt and must be paid in cash only. Please send in the correct amount of money as the school does not have change. Penny Wars is this week from April 22-26. Students who sold Little Caesars pizza kits will be able to pick up their orders from the cafeteria this Wednesday, April 24th. Reminder that we have a Late Start this Wednesday, April 24th. The first bell will ring at 9:35 a.m. Reminder that 4th grade starts M-Step testing next week. Make sure your child gets a good night’s sleep, eats a healthy breakfast in the morning, and arrives to school on time. We will start with ELA testing then complete Math M-Step testing the week of May 6th. Mr. Stinson has scheduled the 4th grade Music Concert for Wednesday, May 22nd at 6:00 p.m. Please make sure your child is bringing their recorders to school every Monday to practice for the concert. Thank you to the Alsandaqchi Family and the Brown Family for donating shared snack to our classroom! Thank you to the Aun Family and the Kanclerz Family for donating shared snack to the classroom. We have a hungry bunch of students every day!